Galaxy S8+ Voice Recorder Guide - Use different recording modes for various situations using new Samsung Galaxy S8 Plus or Galaxy S8, such as in an interview. 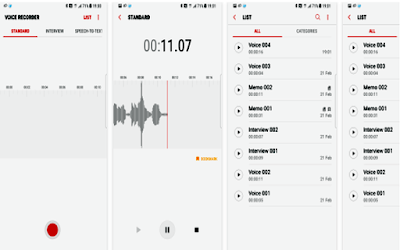 Learn here how to use Voice Recorder on Galaxy S8. 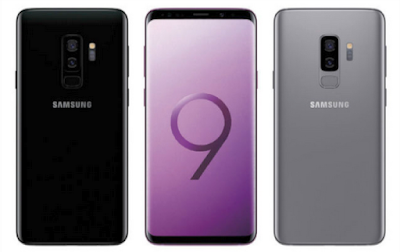 Samsung Voice Recorder Galaxy S8 is designed to provide you an easy and wonderful recording experience with high quality sound, while also offering playback and editing capabilities. For your everyday needs, Samsung developed a “Voice Memo” recording mode so that you can convert your voice to text (Speech to text). The S8 device can convert your voice to text and distinguish between sound sources. 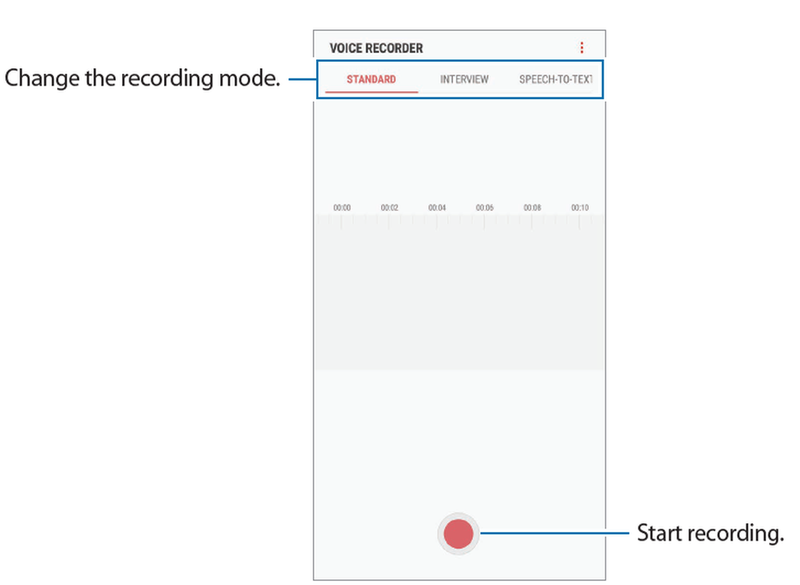 The Voice recorder allows you to record an audio file and then immediately share it using Messaging, Gmail, or Bluetooth technology. Recording time will vary based on the available memory on the Samsung Galaxy S8 or microSD card. The following Samsung Galaxy S8 Voice Recorder permissions are required for the app service. For optional permissions, the default functionality of the service is turned on, but not allowed. Open the Samsung folder and launch the Samsung Voice Recorder app. Tap Record to start recording. Speak into the microphone.Tap Pause to pause recording. Enter a file name and tap SAVE. If the recording is stopped, you will be taken to the Recordings screen. Saved audio files will appear in the list. Open the Samsung folder and launch the Voice Recorder app. STANDARD: This is the normal recording mode. INTERVIEW: The microphone is sensitive to sounds from two directions. In this mode, both the top and the bottom of the device pick up equal amounts of sound. SPEECH-TO-TEXT: The device records your voice and simultaneously converts it to onscreen text. For best recording on your Galaxy S8, keep the device near your mouth and speak loudly and clearly in a quiet place. If the voice memo system language does not match the language you are speaking, the Galaxy S8 Plus / Galaxy S8 will not recognise your voice. Before using Galaxy S8 Voice Recorde feature, tap the current language to set the voice memo system language. 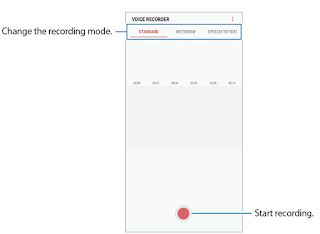 During recording, You can reject incoming calls while recording. Used to decline calls received while recording and provide Voice Label function Voice Recorder. To delete Voice Recorder, touch and hold an audio file and touch Delete. Touch OK to confirm. Built-in sound player supports media controls such as Skip muted, play speed and Repeat mode. 3. Touch open to open the Recordings screen. 4. Touch the file name to begin playback. Pause: Pause playback of the audio recording. Play: Resume playback of the audio recording. Fast Forward: Skip to the next audio file in the list. Rewind: Skip to the previous audio file in the list. Trim: Edit the audio file. AB Repeat: Touch once to set the A point and again to set the B point. Touching 1 will play the audio between the two points. Playback Speed: Adjust the playback speed. Skip Silence: Automatically skip to places where the audio recording picks up sound. Bookmark: Bookmark sections of the audio recording. Move the trimmers to the desired length of audio. Touch Listen to hear the trimmed section. Touch cancel to cancel the editor, or touch to save the edited section. You will be able to replace the file or create a new audio file. 1. From the Home screen, touch Voice recorder Apps. Save to: Choose where the application stores audio files. Recording quality: Choose from High or Normal. Recording volume: Choose from High or Low. Contextual filename: Add GPS data to the audio recording file name. Default Name: Edit the default name of the audio recording. 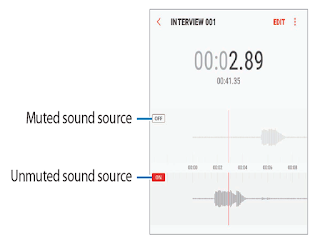 Noise reduction: Reduce the recording of background noise by turning this feature On or Off. Location tags: Add location tags to your audio recordings. Language: Change the default language. Touch Record button to select the recording mode. 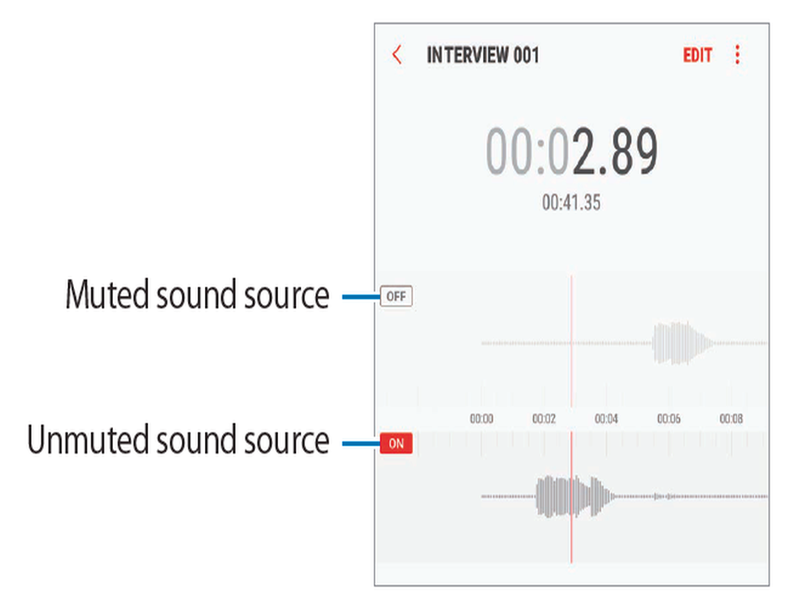 When you review interview recordings, you can mute or unmute certain sound sources in the recording. 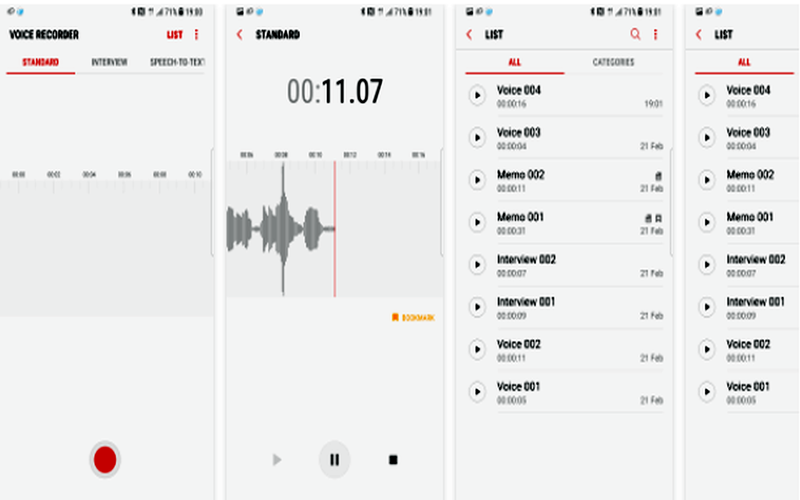 Tap LIST and select a voice recording made in interview mode. To mute certain sound sources, tap on for the corresponding direction that sound is to be muted. The icon will change to off and the sound will be muted. Share your Galaxy S8 voice recordings with your friends via Email, Messages, OneDrive, WhatsApp, etc.